The Rebel Sweetheart. : Asthma is Evil. The past few days had been very stressful. I had colds and a slight fever two Fridays ago (November 16), and by Sunday (November 18), the little man was sniffling as well. He woke up with a cough and a 38 degree fever the following morning (November 19) so I took him to his pedia for a check-up. His fever was gone by Tuesday (November 20), but the little man still had cough and colds, causing him to eat very little. Things took a turn for the worst on Wednesday afternoon (November 21) - the fever came back (rising as high as 38.5 degrees), his cough was nasty and his colds prevented him from breathing through his nose, plus he wasn't eating anything save for a few spoonfuls of soup and small sips of water. 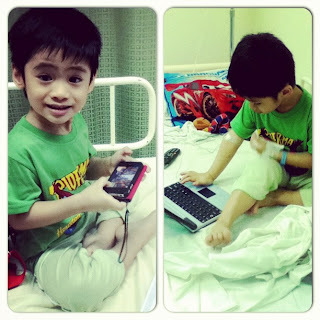 I had no choice but to have him admitted to the hospital, and that same evening we were back to where we were three weeks ago - the San Pablo City Medical Center. Although his first confinement was because of pneumonia and UTI, his condition back then was actually much better. He had no fever, he ate well, his cheeks had more color, and he was his usual sprightly self. His second confinement worried me (and stressed me) a lot because he had no appetite, he looked really pale and wan, and he was overly cranky most of the time. He lost weight drastically, which you can easily tell just by looking at his face. All this just because of bronchial asthma. Asthma is evil, and unfortunately it runs in my (mother's) side. My brother has it, Mum has it, my late grandfather had it. And now, of all the things the little man can inherit from me, it had to be the asthma. As of this writing, we're out of the hospital and back at home. The little man hasn't gone back to school; I want his body to rest for another week before we go back to the daily grind. He's still coughing a bit, but the fever is gone and his appetite is back. Once he finishes this round of Clarithromycin, we're going back to his pedia for a follow-up check-up where he will be given a new set of meds. 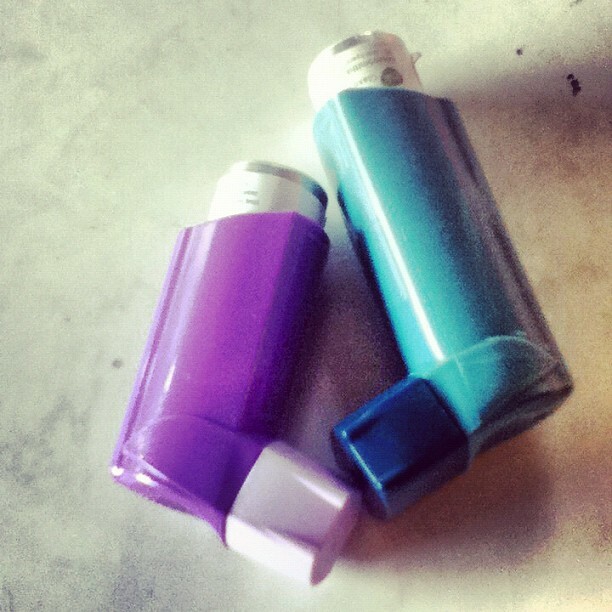 Baby inhaler (Seretide) and Mommy inhaler (Ventolin). I hope the little man's health gets better, too. Me getting sick is bad enough, but when Yue is sick it feels like all hell has broken loose. I also had asthma when I was younger but was able to overcome it when I grew up. It helps also that I have a sporty lifestyle. That's pretty bad. :( My mom's sides too have asthma and some of my siblings inherit it. Luckily I dont have it yet, unfortunately, my son got it. I dont use ventolin although it's prescribed by doctor. (hahaha makulit lang tlga ako nagmana ke mama) we use CMD or if not, the common method na pausukan?? water and salt then boil it. Instantly, relief! I hope he makes a full recovery! He looks really pale and it's very obvious he lost weight. Hang in there. I can't imagine how difficult it must be to see your child suffer like that. I hope he is feeling better! I'm glad he's feeling better now! Asthma really is evil. My youngest niece (she's about 6 years old) has it and she gets confined in the hospital so often in a year, probably 2-3 times. She got it from my BIL's side though so I'm thankful Jacob has a lower chance of getting it. Praying for his full recovery! Poor little guy! It sure does sound like he has had a rough few rounds lately. I hope he responds well to the treatment and is back up on his feet again in no time! I am glad he is out of hospital, I know they try to make it as nice as possible but nothing compares to hope. Said a prayer for his good health, hang in there. Ouch! hope your little boy is OK now. Blame it also on the weather changes that possibly trigger his asthma. Just make sure his free away from the risk factors. Take care always, cheers!!! I'm also sick right now too. Blast the weather :( Hope your lovely kid gets better though! Both my parents side has asthma which was transferred tp me .My hubby also has history of it and unfortunately our youngest got it too.Evil asthma really is around my household. I'm glad he is feeling better. Asthma can be a scary thing. My prayers are with ya'll. That's awful, I hate when kids are sick my brother in law has asthma and as he gets older it gets better. Fingers crossed. Oh my... having a child confined is the worst experience and I can only imagine how you must have felt. Good to know he's back home! Take care you two! Have seen many kids struggling with Asthma.. Hope he is feeling better now.. It's so painful see kids struggling.. God Bless!! Oh I hope you feel better baby boy. My siblings are also suffering from asthma. My sister actually has to take fluimucil on most days. Hi Momi. I feel for you. Ang hirap pag may anak na may asthma pero mas mahirap pag ikaw mismo ang mom may asthma. My (3) kids have asthma and the same din ang meds nila ng son mo. Lumabas asthma ko after I had CS with my 2nd child. I developed a lot of allergies sa pain killers so when I gave birth sa 3rd child ko nahirapan ang mga doctors maghanap ng pain killers. Siguro thrice a year ako na coconfine due to asthma at halos every month na ra-rush ako sa ER. Meron akong Nebulizer at nag shift na ako from seretide 250mcg puff to 500cmg Discus. Last June, I decide to change pulmo kasi parang lagi nalang ako nagkakasakit and lahat ng gamot na nirereseta parang walang effect. I was confined at Makati Med for a week and was diagnosed with Pneumonia and Lobar Emphysema. Di ko alam na may bullae na sa loob ng upper left lung ko at sobrang expanded na ang lung ko dahil sa asthma and napipisat na ang heart ko. I was referred to Phil. Heart Center for a lobectomy - that means they have to take out my upper left lung. I was in the ICU for 3 days and stayed in the hospital for a month. Worse - I have to wear a chest drain for another month to drain excess blood and water sa chest ko. Anyway, after that gruesome and painful surgery, naging ok na ako. no more heavy breathing - and no asthma attacks. Sana nga tuloy tuloy na ito. BTW - I got the emphysema from 2nd hand smokers. Kaya I really hate cigarettes. Sana my kids hindi magkaganito balang araw. I hope all is well with you right now. Hoping your kids are all in the pinkest of health, too! Thank you everyone, for all the kind and encouraging words. I really, really appreciate it. The little man is doing better now, his appetite is back and eating a LOT. The cough is almost gone, no more wheezing and shortness of breath.